NEW ORLEANS, La – A Studio In The Woods (ASITW), an artists’ retreat in Lower Coast Algiers and a program of Tulane University, welcomes Pippin Frisbie-Calder as an artist in residence presenting Microscopic Sirens. Printmaker Pippin Frisbie-Calder will be collaborating with Dr. Tim McLean of Tulane University to create a body of work around wetland micro algae awareness. 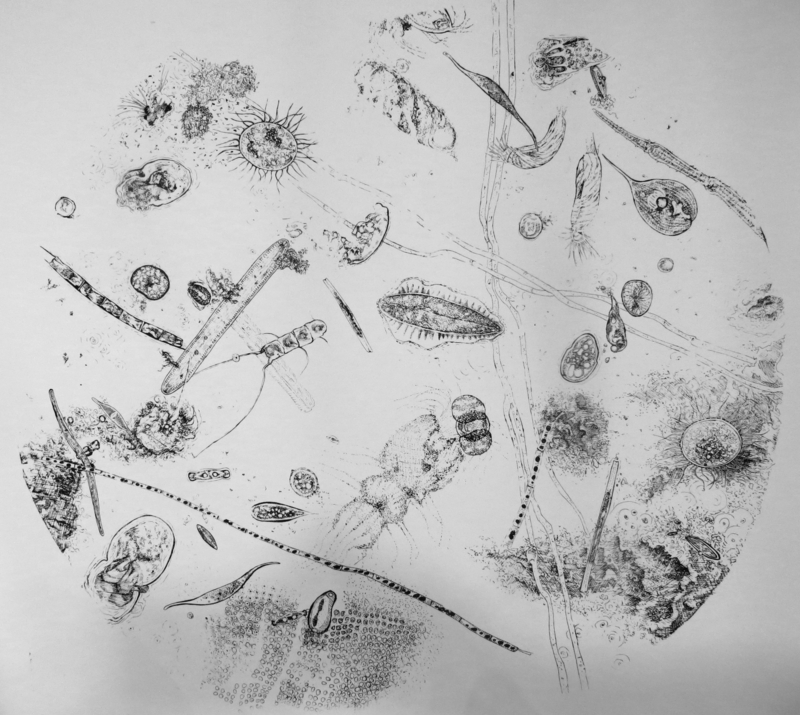 Projections of phytoplankton, glowing sculptures, woodcuts and drawings will act as large-scale representations of the aquatic micro-organisms of the wetlands and oceans and demonstrate their importance within the larger ecosystem. This project aims to serve as an educational tool, hoping to draw all members of the public, independent of wetland awareness and appreciation, since few people even among researchers are aware of and recognize the microbial presence, diversity, beauty, and roles within the waters of the wetlands. For more information, visit www.astudiointhewoods.org. You can also visit http://pippinprint.com, https://nolastudiola.com/ and www.thetigermenden.com for information about the artist and gallery. A Studio in the Woods pairs land preservation with intimate artist residencies to stimulate social and environmental change. A new residency series, “Flint and Steel: cross-disciplinary combustion,” matches artists with Tulane University faculty members to create risk-taking new works designed to ignite social change. Artists collaborate with scholars from corresponding fields to expand their reach in the larger community. A Studio in the Woods is a program of Tulane University.